January 26, 2019 By David Bahde & filed under All Articles, Rifles & Carbines, Weapons. Pistols make it much easier to maneuver in and out of vehicles and then fight with them as you move to cover. Short-barreled ARs remain the preferred choice for law enforcement, home defense, and personal protection. Their lighter weight is a big factor, but they also fit better in police vehicles, ATVs, and motorcycles. They have drawbacks for sure, including loud, oppressive muzzle blast, and they can be difficult to suppress. Depending on the caliber, they may be less effective and finicky about ammunition. Still, they remain desirable, with the biggest issue being they are a pain to get unless you are a government agency. Purchasing firearms classified as SBRs (Short Barreled Rifles), the NFA (National Firearms Act) paperwork takes months to process for most. Transfers to government agencies take less time, but you still end up with an NFA restricted rifle that is harder to trade or resell when it’s time to replace them. Even with increased demand, they remained rare … until the rifle-caliber pistol hit the market. 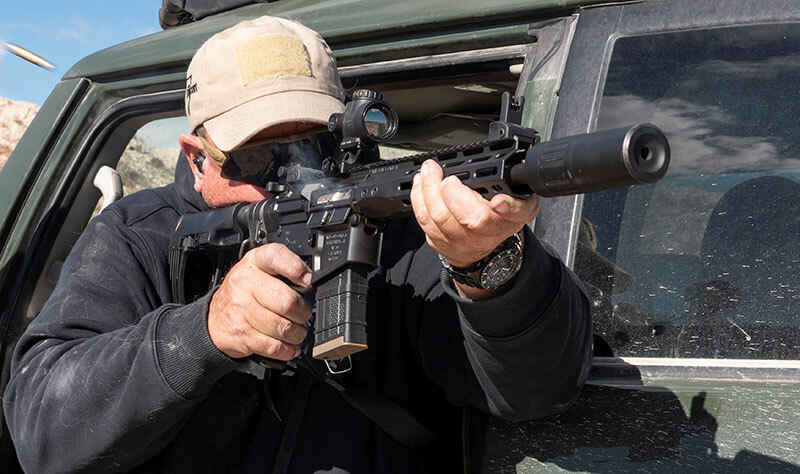 With the advent of the arm brace, the ability to acquire rifle-caliber AR pistols has changed considerably. Not only do arm braces remove the hassle and $200 tax stamp, but they are also more widely legal to store in vehicles. Transport between states no longer requires ATF notification, and even the police world is taking a serious look. Wilson Combat bolt carrier groups are coated using NP3 for protection and smooth operation in adverse conditions. Rifle-caliber pistols with arm braces can be configured to fit easily in tight spaces and purchased immediately, with no more 30- to 60-day wait. Recent rulings preventing you from becoming a felon for shouldering one, and changes in the design have made them far more user friendly, and the industry has come through with tons of choices, including caliber. One of those has been particularly interesting to me: the Wilson Combat 300 HAM’R. 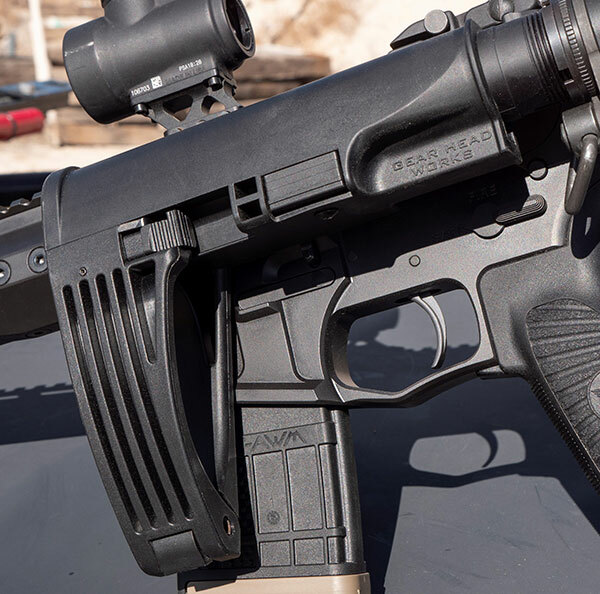 Wilson Combat originally designed this caliber as the “perfect ranch rifle” using the AR-15 platform—one rifle that can deal with predators, harvest game, and protect livestock from as far away as 300 yards. Typical 5.56mm or .300 BLK does acceptably well on unwanted predators out to 100 yards, and farther for small varmints, but neither is particularly suited to hunting real game, or in some cases legal to hunt with at all. Wilson Combat 300 HAM’R is a compact pistol that—even suppressed—is lightweight, reliable, and easy to use. AR-10 rifles in .308 or similar are great, but are heavy, expensive, and less than ideal inside 100 yards. You need something in the middle, and Bill Wilson has met that need with the 300 HAM’R. Extending the .300 BLK case improved accuracy and consistency using proven .308 bullets. Increased capacity and Hodgdon’s CFEBLK powder bumped velocity as much as 200 feet-per-second (fps) with less pressure. Utilizing a 1:15 twist rate optimized it for longer range consistency using bullets from 110 to 150 grains. Real-world testing—including 200+ pound feral hogs to 300 yards, even a bull elk at 200 yards using 150-grain hard-cast bullets—has proven its effectiveness. Personal testing has been impressive using 16- to 18-inch barrels, but I wanted to know how it worked in a 10.5- to 11.5-inch barrel—the perfect duty and self-protection length. Gear Head Works Tailhook 2 is light, strong, and makes it easy to fit most wrists or forearms for braced shooting. 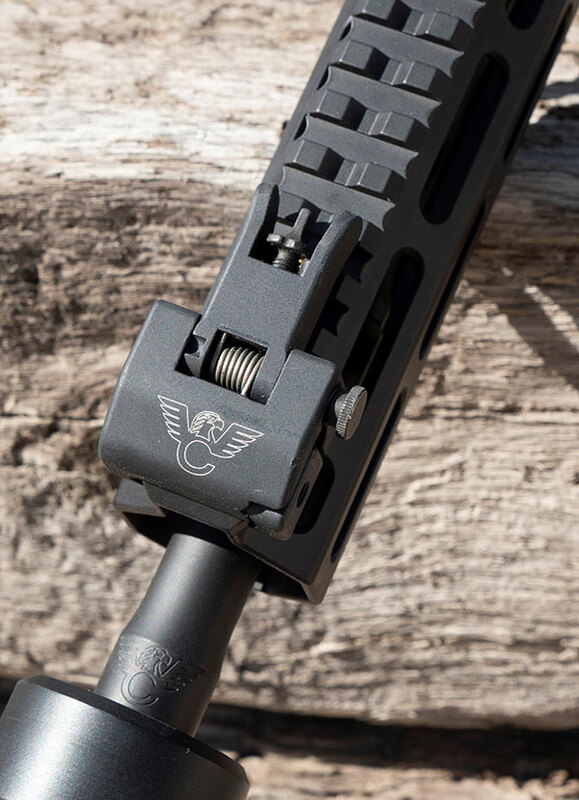 Wilson Combat’s pistol variant uses an 11.3-inch barrel and Gear Head Works Tailhook 2 brace. An arm swings down, providing support for one-handed shooting, and locks in the up position for storage. One of the few that works with my short and stout forearms, it’s adjustable for length. The carbine-length buffer tube lets you keep your standard buffer and spring. The barrel is stainless steel and moderately contoured with a 1:15 twist and carbine-length gas system. Threaded 5/8×24, it comes with a Wilson Combat Q-Comp. 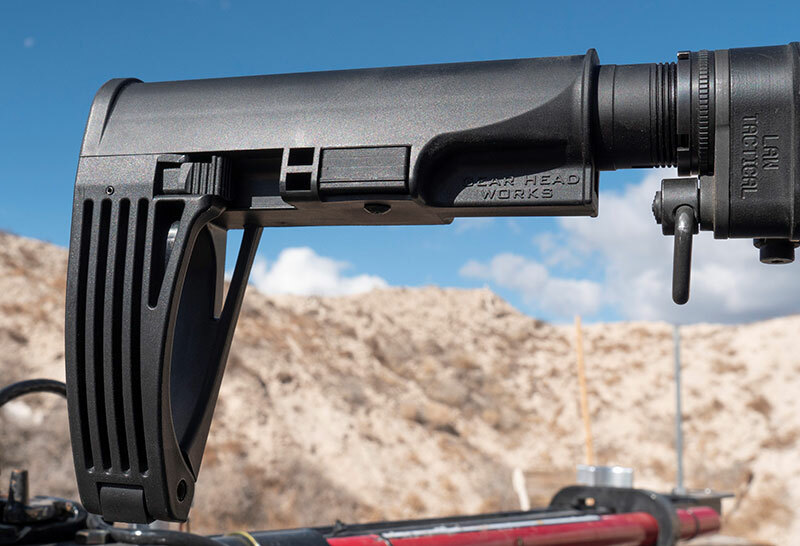 Extending most of barrel’s length, Wilson Combat handguard is thin, lightweight, and comfortable. 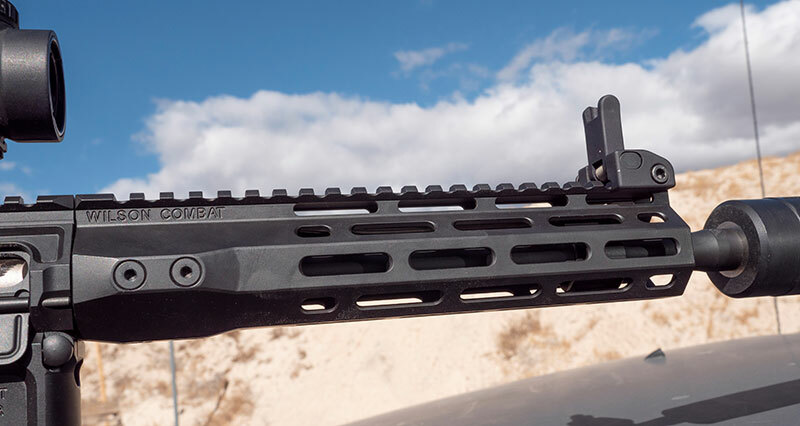 M-LOK slots along its length provide ample places for accessories. 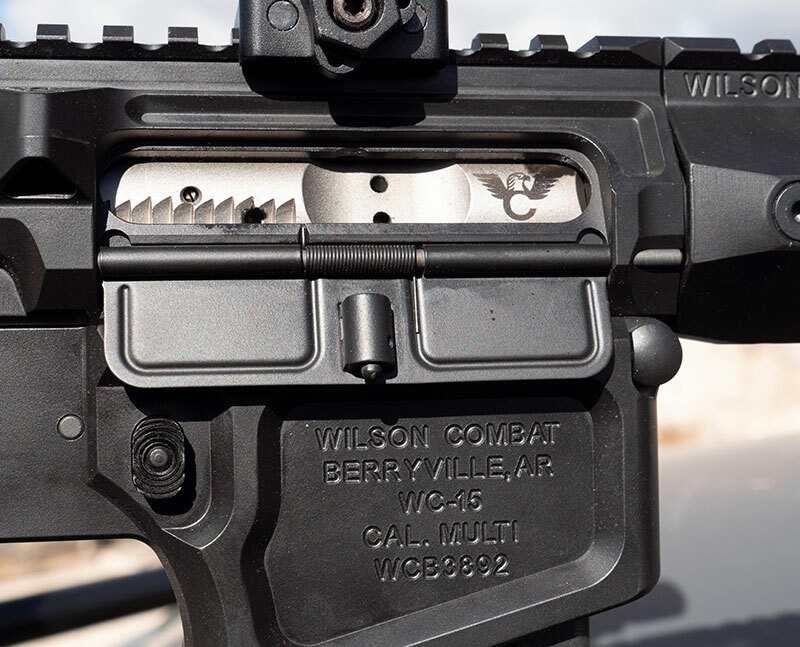 Receivers are Wilson Combat lightweight billet using their 9.5-inch M-LOK compatible rail. Trigger is a two-stage TTU (Tactical Trigger Unit) measuring four pounds. The bolt carrier group is WC premium coated in NP3. It ships with one Lancer .300 BLK 20-round magazine in a Wilson Combat custom nylon case. Law Tactical Gen3 folding mechanism keeps pistol compact and easy to fit into tight spaces without sacrificing strength or reliability. Having tested a couple of 16-inch models out to 500 yards, the idea was to keep this one setup for typical duty or protection work. A Law Tactical Gen 3 folding mechanism was added to help it fit in tight spaces. A Trijicon MRO Green was mounted, along with a set of Wilson Combat folding BUIS (Back Up Iron Sights). A Suppressed Armament Systems K9S suppressor keeps things short, adding only four inches using direct threading. 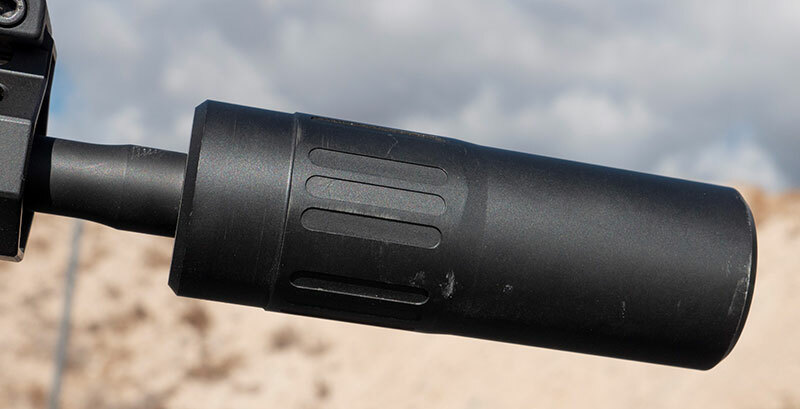 At 12.7 ounces, the suppressor is lightweight, and its design provides excellent sound suppression with lower back pressure. Even with the Law Tactical folder, which adds an inch, and suppressor attached, it’s shorter than a 16-inch version. 300 HAM’R is incredibly accurate with a wide variety of ammunition. 110-grain Controlled Chaos is as accurate as you can shoot an AR. Accuracy testing with the 16-inch rifles was stellar. Nothing changed with the shorter barrel, and my best group with the 110-grain Controlled Chaos (CC) was right at .50 inch. Designed specifically for this caliber by Leigh Defense, it’s about perfect for urban defense or police applications. It’s demonstrated excellent barrier penetration capabilities in testing. At the same time, its “petals” fragment after initial penetration, creating multiple wound channels in vital tissue, while the core penetrates deeply without overpenetrating. Made from 100% copper, it also meets any “green” requirements an agency or state may have. Wilson Combat offers several 125-grain loads that are a bit more traditional in design, including Speer TNT, along with 125- and 130-grain Hollow Points. A 110-grain HP also matches the CC perfectly. HSM Ammunition is going to be making loads as well, with a few more showing interest. All the WC ammunition grouped at or under an inch at 100 yards. In fact, everything fired through this rifle fell inside two inches (no more than an inch up or down) using the 110-grain CC load, including both the 130- and 150-grain hard cast. 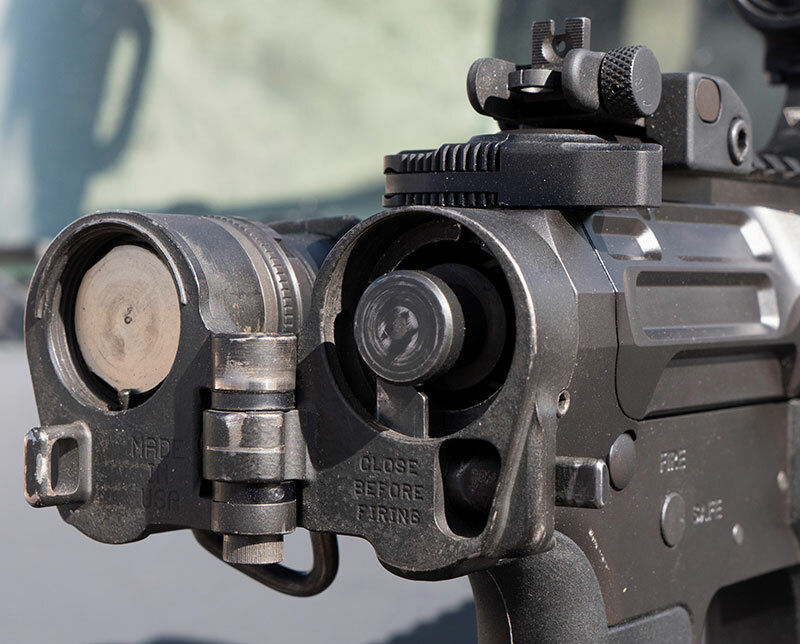 Wilson Combat back-up iron sights are light, strong, easy to use, and lock into place when necessary. Hard-cast bullets are not ideal for police or defensive loads, but they are perfect for larger predator control. Game wardens or agencies in states with predator issues can swap mags as needed and go from a highly effective patrol rifle to serious predator control. Accuracy at 300 yards was just as impressive. Using a Leupold VX-6HD 1-6X scope, the 110-grain CC produced a two-inch group. Both the 125-grain TNT and HP loads grouped under three inches. Using the MRO zeroed at 50 was hold center at 50, 100, and 200, and slightly high at 300—about perfect for a duty rifle inside 300 yards. Operation with .300 BLK mags was flawless, and it’s designed to use those. On 5.56mm mags with the bullet guides inside, the magazine canted them a bit, making them less than ideal. I used a ten-round Lancer without issue, but the best magazines are .300 BLK centered. No stoppages, with consistent brass ejection at about 3:30 or 4:00. Recoil is similar to a short-barreled 6.8 SPC, nowhere near as much as a .308. Rapid fire is very controllable, and the Wilson Combat Trigger has proven to be completely reliable. Throwing the upper on my M16 lower, doubles were about perfect at CQB ranges, with no stoppages. Suppressed Armament Systems K9S is light at 12 ounces. It keeps pistol well balanced and makes it easy to shoot braced or one-handed. The Suppressed Armament K9S was a perfect match. Mostly available to LE until now, it had so little back pressure it did not affect brass ejection. There was no excess gas in my face, and ammunition in the magazine was far less dirty than a standard suppressor. It was noticeable, but not caked on like most 11-inch barreled 5.56s would be. Impact shift was less than an inch, all vertical. Sound suppression was impressive for what amounts to a four-inch baffle section. Hearing safe? Not really, but it was a no-pain affair, quieter than some that are an inch or two longer. It’s perfect for a fighting rifle, but wear hearing protection when you practice. Velocity was 2,400 feet-per-second (fps) with the 110-grain CC compared to 2,600 out of the 18-inch barrel and 2,550 or so from the 16-inch. That’s about the same as a 12- to 13-inch .308 using 147-grain bullets. Loaded with the 125-grain projectiles, you get near .308 ballistics for bullet weight without the weight, muzzle blast, cost, and reliability issues. 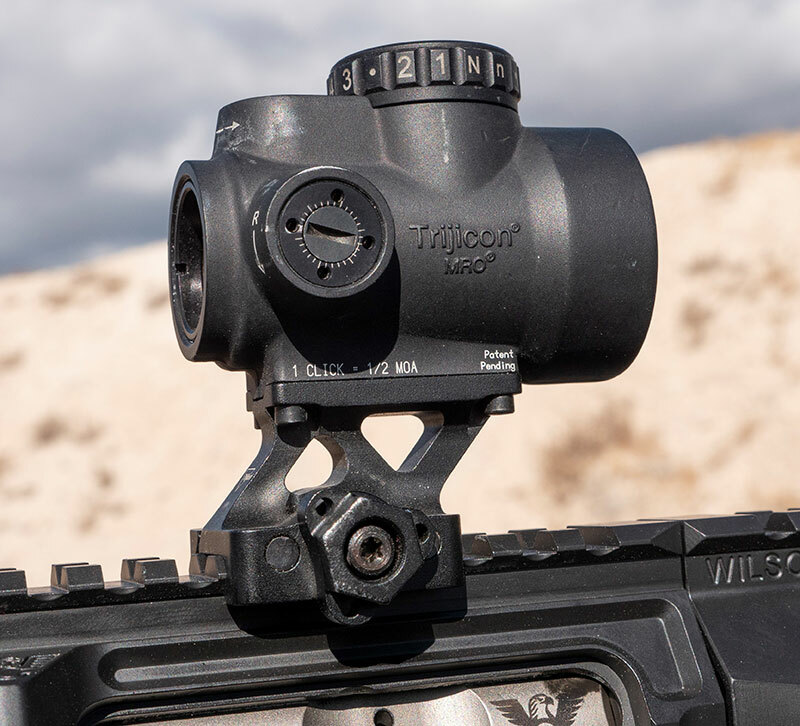 Trijicon MRO is rugged and reliable without the weight and tunneling effect. Green LED is easy on the eye in all conditions. At 7.5 pounds with the suppressor, Trijicon MRO, sights, and Law Tactical folder, it remains lightweight and manageable. 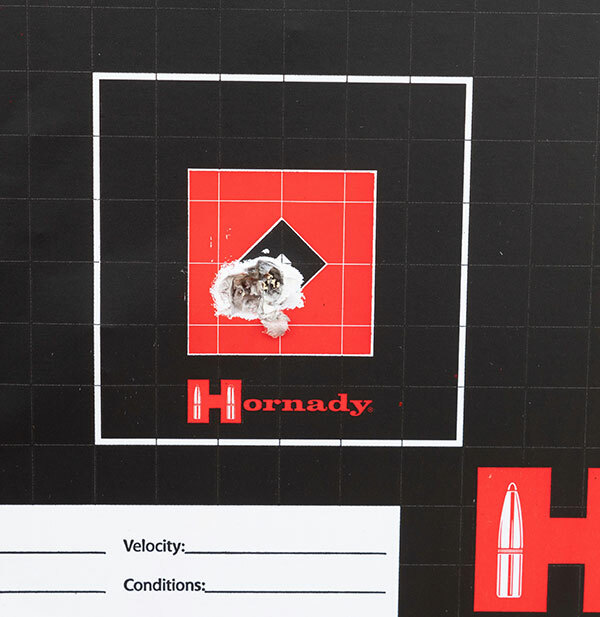 Energy at the muzzle (1,410 pounds) is similar to some 5.56mm, but the comparison ends after 100 yards, with the HAM’R producing almost twice as much at 300 yards. Move to bigger bullets like the 130-grain HP, and it’s even better. The only other “gap” cartridge that’s close using an 11-inch barrel is the 6.8 SPC, and it’s very close, but you add a different bolt, caliber-specific magazine, and ammunition that can be very inconsistent from rifle to rifle. In every other aspect, the 300 HAM’R is better. Clearly, I like this rifle and cartridge. That being said, it took convincing. I have been testing rifles designed to fill the gap between the .223 and .308 for decades, so skepticism ruled. After a few hundred rounds of concerted and serious testing, I was convinced that this is different. 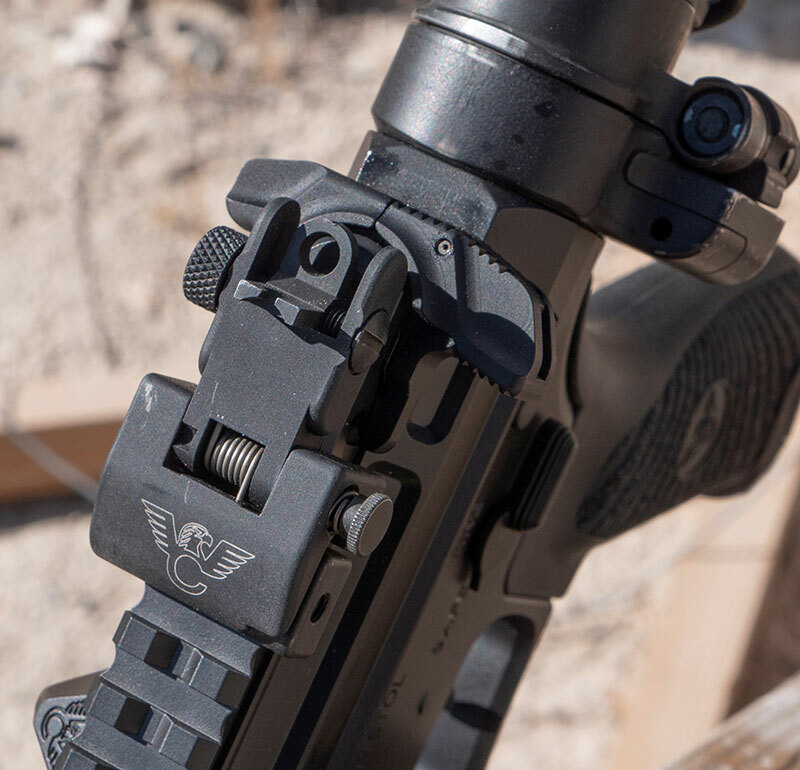 Wilson Combat rear sight folds flat, making it easy to add low-power variable optics while keeping irons at the ready if needed. Will it replace the 5.56mm? Absolutely not. Many agencies don’t see 100 yards, let alone 300, so a 50- or 55-grain TSX is all you need. If predators weigh 40 pounds and look like Fido, you are good. I will still hunt coyotes with my .223 and 53-grain VMAX. That being said, the 300 HAM’R will do all of those things as well or better. If you need one rifle that gets most anything done at 300 yards or closer—and occasionally out to 500 yards—it’s perfect. Agencies with farms and large property will like this a ton. With the 150-grain HC, it will take care of an occasional bear or bigger nuisance animal. Not satisfied with the terminal ballistics or concussion of your 10.5-inch .223, or tired of sucking up tons of gas, this will get that job done without either. For bringing home the meat on the farm, it’s about perfect. All of this is without a barrel swap and .300 BLK magazines for your standard AR-15 carbine. Right now, I’m just not sure it gets any more versatile. Wilson Combat has really done well with this. If you need something that’s a bit more, give the 300 HAM’R a serious look. If you want it short, light, and convenient, make it a pistol! Locked in place, Gear Head Works brace is solid and strong without adding weight. Measured using a Magneto Speed V3. Accuracy average of three five-round groups fired from 100 yards using a bipod as a rest from behind a bench.